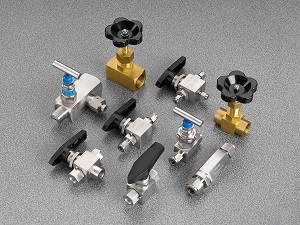 The new Brennan compression-end instrumentation valves are available with single or double ferrule-style tube fittings and are tested for quality prior to leaving the factory. 	NVB Series Ball Valves range in size from 1/8- to 3/4-inch and are available in either 316 stainless steel or brass construction. These valves can have two- or three-way configurations and are rated to 3,000 psi. 	NVN-2200 and NVN-2300 Series Screwed Bonnet Needle Valves range in size from 1/8- to 1-inch and are available with either metal-to-metal or soft-seat stem types. The 316 stainless steel valves are rated to 6,000 psi and the brass valves are rated to 3,000 psi. 	NVN-2000 and NVN-2100 Series Integral Bonnet Needle Valves range in size from 1/8- to 1-inch with metal-to-metal stem types with V stem tip form. The 316 stainless steel valves are rated to 6,000 psi and the brass valves are rated to 3,000 psi. 	NVC Series Check Valves range in size from 1/8- to 1-inch with O-ring seat seals. The 316 stainless steel valves are rated to 6,000 psi and the brass valves are rated to 3,000 psi.